AYURVEDA, NATURE’S MEDICINE is an excellent introduction to the full field of Ayurvedic Medicine from diet and herbs to yoga and massage. The book is a primer for students beginning in the field who wish to have a firm foundation to understand the entire system. It is one of the main textbooks on Ayurveda used in the West and reflects the syllabus of two year Ayurvedic studies in India. Systematic in its approach from life-style factors to treatment, especially with herbs. The book combines the work of Frawley with Subhash Ranade, one of India’s most widely traveled and published Ayurvedic teachers. 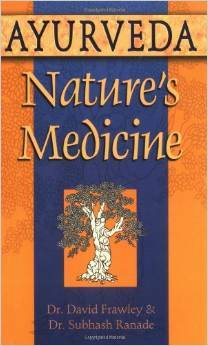 Required reference book for our Ayurvedic Healing course.